The exhibit includes photographs and memorabilia depicting Muncie history. 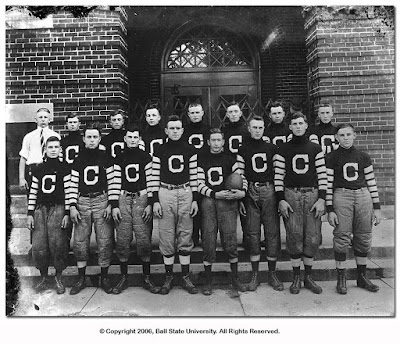 Some unique local history items from the Archives and Special Collections include early diaries of Muncie residents describing the gas boom, a pardon signed by President Franklin Delano Roosevelt for Muncie Mayor George R. Dale, an 1885 inventory for the Star Drug Store, a photograph of the Congerville Flyers professional football team—one of the original teams in what would become the NFL. 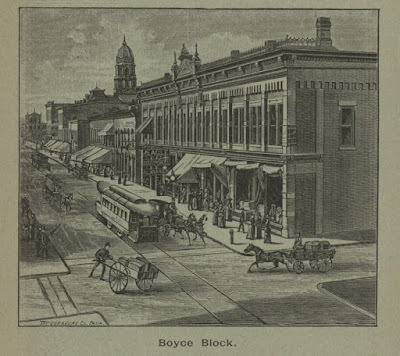 The GIS Research and Map Collection across the balcony in Bracken Library will be featuring maps showing Muncie history: A bird’s eye-view map of the city from 1872; an 1888 map of natural gas wells in Muncie; a 1907 map showing the city’s steam railroads, interurban lines, and street car lines; a pictorial map showing Muncie merchants in 1985; a 1950 postcard map of Muncie; and a view of the Boyce Block in 1893 and via Google Earth in 2013. The GRMC created a custom map for the exhibit—A Year in the Life of Magic City: The Thomas Neely Diaries. This map uses historic Sanborn Fire Insurance maps and photographs and advertisements from Muncie city directories (available in the Archives and Special Collections’ Digital MediaRepository) to show locations of happenings described by Thomas Neely, a city founder, in his diaries including the location of his doctor, bootmaker, and an important community gathering location—the roller skating rink. 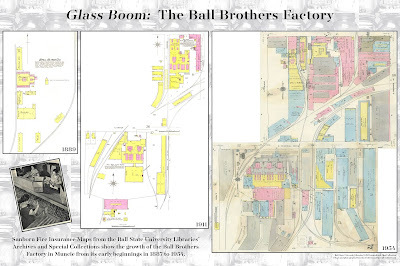 Another map (above, click to enlarge) exhibit shows the growth of the Ball Brothers Glass Factory over time. 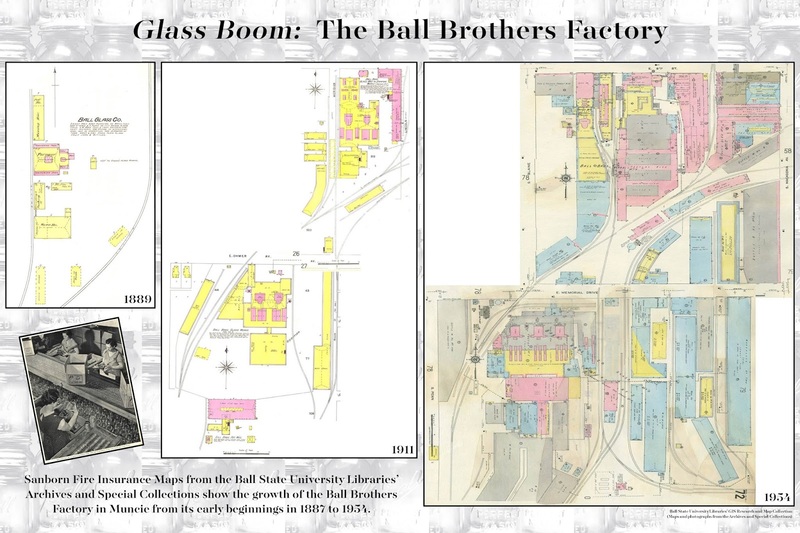 This map also uses historic Sanborn Fire Insurance maps to detail the changes in this important company in Muncie history. The exhibits will remain on display until September 30. Visitors may park in the Emens Garage directly behind Bracken Library. 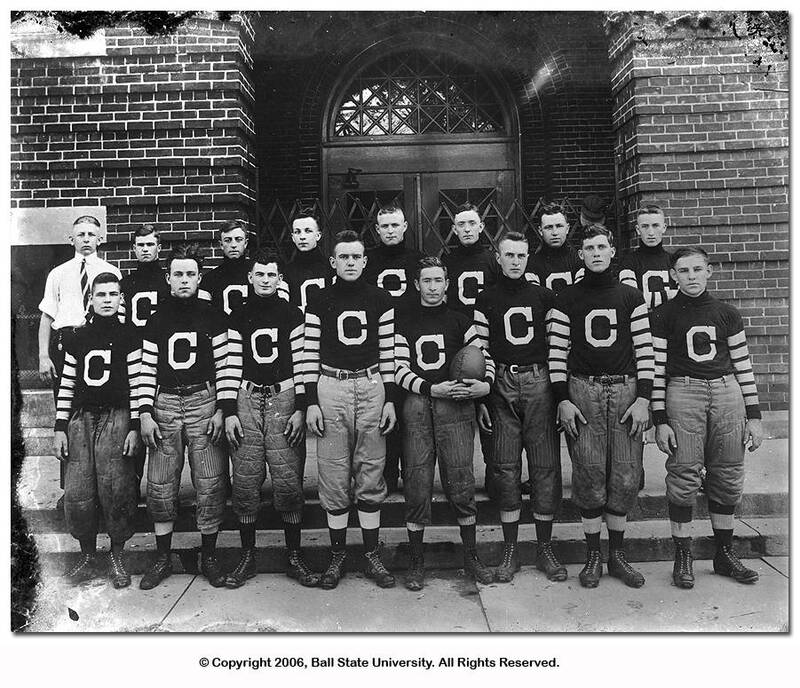 For more information, please contact the Archives and Special Collections at 765-285-5078.